Less is more for the stylish Wireless DJ app, one of two we’re testing today to add remote control to Traktor. There has been lots of talk about DJing with the iPad or iPhone, and programs like djay have got off to a great start in this new DJing field, but another way of using your iOS device for DJing is as a remote control for your existing software – just like a DJ controller. Virtual DJ has already released an app like this for the iPhone (iRemote), and of course TouchOSC is a favourite with Ableton Live users. But there have not been any apps designed especially for Traktor – until now, when two happen to have come along at once. 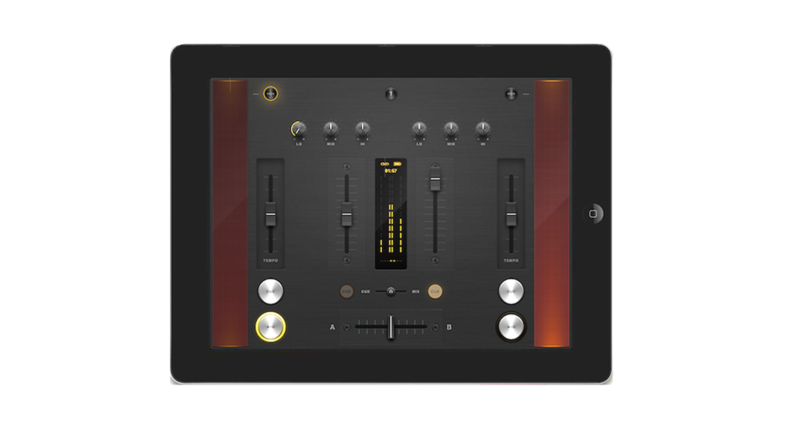 Wireless DJ is a minimal two-channel wireless mixer/controller for Traktor Pro running on Mac and an iPad (although as it is a Midi application you can map it to any Midi software, in theory at least). It’s stylishly presented with a gun-metal effect scratch-style mixer on your screen, but with iPad-style gloss touches too. The whole lot happens on one screen – a mixer. Installation is simple – there’s no IP address stuff or mapping issues. You get the iPad and the Mac on the same wireless network, use your Mac’s Audio MIDI Setup utility to link things up, install the TSI file and and you’re off. (You can use with a Windows PC but you’d need extra software.) It works well and coupled with the ease of set-up it’s pretty impressive and undeniably fun – there are faders, EQ, headphone and playback controls and even needle search. Instead of jogs, it has vertical strips down the sides of the mixer that they call “magic stripes”- Moving your finger up and down one of these executes a pitch bend, two fingers is fine tempo control. So that’s all good – but there are no cue points past the first one, there’s no control over loops and effects, absolutely no library browsing – you won’t be wanting to stray far from your Mac. However, set up alongside your computer, it gives you a really smart way of controlling the basic functions, while you can then resort to the keyboard shortcuts for library, loop, cue points and FX. 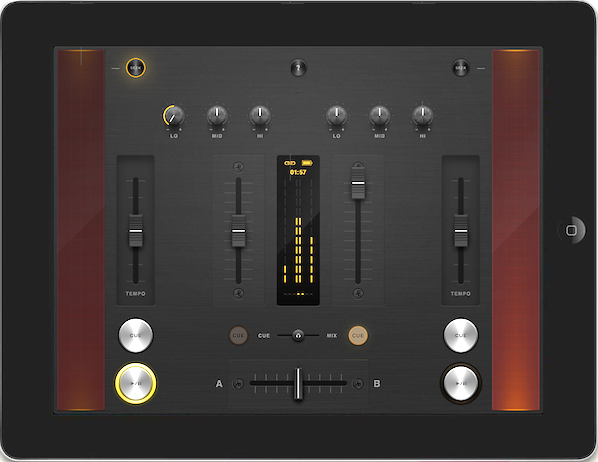 Iximix’s TrakProDJ is exactly the same in concept, although this time the app can also run on the iPhone / iPod Touch (or even both together!) with concessions made on the latter due to the screen size, of course. It’s for Mac and Windows. So again, for Mac you get the iOS device on the same network, link the two together for Midi using the Audio MIDI Setup utility, and install the TSI file in Traktor. It’s slightly more complex for Windows apparently, but I didn’t test this. This app is different in that it attempts to offer a more complete DJ controller. On the iPad, it looks like a typical control surface with two jogwheels and a mixer in the middle. On the iPhone, you can flick between decks, mixer and FX. I found the sensitivity on the jogs a bit much – you had to be careful not to overdo your actions. There’s a needle search too, and this time there’s also a track browse function, although for some reason I couldn’t get it to work fully – it’d load the selected track, but the scrolling didn’t work for me. Access to both effects units is included, and there are hotkeys you can assign to cues, loops etc as you see fit. You also get a filter control for each deck, and kills alongside the EQs – good for touchscreens as turning knobs is kind of awkward. I liked this one too, although the VU meters on the iOS screen peak out of time with the music, which is a bit disconcerting. But that’s not the whole story. By just copying the types of controls you find on a “normal” controller (and I’m thinking mainly the jogs) I think TrakProDJ misses a trick – after all, it’s a touchscreen, not something tactile. This is where Wireless DJ has an edge – those “magic strips” are more fun than jogs, and suit the surface better. 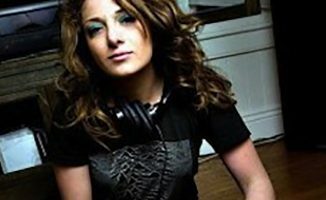 For me Wireless DJ looks better to – TrakProDJ, you feel, should “look” like Traktor, which it doesn’t, whereas Wireless DJ makes sense just looking like a cool scratch mixer. TrakProDJ also works on the iPhone (and iPod Touch), making it the first iPhone remote control for Traktor. With Wireless DJ, you’d definitely want it set up next to your laptop, to use alongside it – it won’t work without that as you need to use your keyboard for many functions still. With TrakProDJ, you could in theory DJ from just the surface, although in reality I think you’d want to use your laptop still for certain functions. If you’re looking for a complete remote control solution, though, it has to be TrakPro DJ. So – they’ve both got their strengths and weaknesses. I don’t think either is quite there yet as far as practical DJing from an iOS surface goes (they both support only two decks, for instance), but they’re both perfectly usable as they are. Have you tried a remote control device for DJ software on your smartphone or iOS device? Would you be tempted to try one of these? Please let us know your thoughts in the comments. The 128GB iPad Is Here… Now Who Says iOS Isn’t For DJs? I think that TouchOSC should at least be mentioned in this article if not featured. I understand it wasn’t written specifically for Traktor but it is by the most robust. I currently switched my setup over from an APC40+20 combo to a DVS setup. My iPad + TouchOSC has allowed me to bridge that setup to give me the control I lost while still allowing me to keep the DVS. Both apps Phil talks about just copy a regular dj controller and that’s in my opninion a fail. 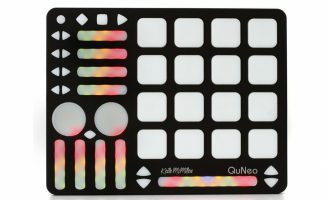 Where touchosc allows you to create your own controller completely fit-4-purpose, which makes the ipad an incredible powerfull add-on controller next to your regular dj set. And with the different tabs you can create a specific controller for different situations which makes the ipad a great backup if your main controller or mixer fails. We’ll be taking a good look at TouchOSC in the near future. I’ve been djing with Albeton live using touchAble app for iPad, a lot of fun, super creative! 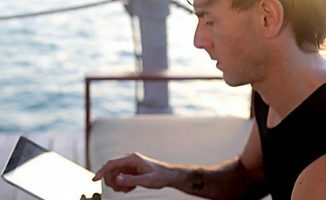 Okay, so if I download the actual traktor app for iPad, can that directly connect to the computer? (I want to be able to use the traktor app to control traktor software, but the music to be stored directly on my mac. Is this possible? Thanks! No, it’s not I’m afraid.